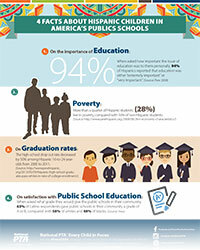 Share the Parents' Guides to Student Success in Spanish. These standards provide clear, consistent expectations for what students should be learning at each grade in order to be prepared for college and career. 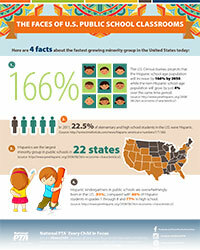 Find inspiration with Bright Spots: The White House Initiative on Educational Excellence for Hispanics. 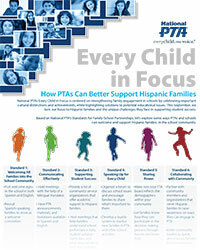 National PTA, Hispanic Heritage Foundation and Univision joined together to host online events. Access recordings from the webinar series at any time: Watch Now! 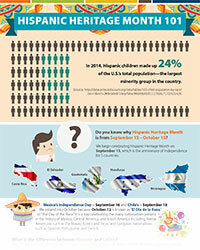 View our weekly infographics for a visual snapshot of Hispanic children and families: Hispanic Heritage 101, The Faces of U.S. Public School Classrooms, 4 Facts About Hispanic Children in America's Public Schools.